Here, we present an in vivo technique for gene transfer to Schwann cells (SCs) in the rodent sciatic nerve. This simple technique is useful for investigating signaling mechanisms involved in the development and maintenance of myelinating SCs. Ino, D., Iino, M. In Vivo Gene Transfer to Schwann Cells in the Rodent Sciatic Nerve by Electroporation. J. Vis. Exp. (115), e54567, doi:10.3791/54567 (2016). The formation of the myelin sheath by Schwann cells (SCs) is essential for rapid conduction of nerve impulses along axons in the peripheral nervous system. SC-selective genetic manipulation in living animals is a powerful technique for studying the molecular and cellular mechanisms of SC myelination and demyelination in vivo. While knockout/knockin and transgenic mice are powerful tools for studying SC biology, these methods are costly and time consuming. Viral vector-mediated transgene introduction into the sciatic nerve is a simpler and less laborious method. However, viral methods have limitations, such as toxicity, transgene size constraints, and infectivity restricted to certain developmental stages. Here, we describe a new method that allows selective transfection of myelinating SCs in the rodent sciatic nerve using electroporation. By applying electric pulses to the sciatic nerve at the site of plasmid DNA injection, genes of interest can be easily silenced or overexpressed in SCs in both neonatal and more mature animals. Furthermore, this in vivo electroporation method allows for highly efficient simultaneous expression of multiple transgenes. Our novel technique should enable researchers to efficiently manipulate SC gene expression, and facilitate studies on SC development and function. The rapid transmission of sensory and motor information in the peripheral nervous system is permitted by the myelin sheath, which is formed by myelinating Schwann cells (SCs)1. Insulation of axons by the myelin sheath enables saltatory conduction, which increases the speed of nerve impulses. In disorders in which the development or maintenance of the myelin sheath is impaired, nerve conduction speed is reduced. This results in neuropathy involving motor and sensory dysfunction. Although there are many studies on the molecular mechanisms of myelination and demyelination in the peripheral nervous system, the roles of the numerous proteins involved in these processes remain unclear. To study the molecular mechanisms of SC myelination/demyelination in vivo, genetic approaches have been used to modify gene expression in animals. A powerful approach is the use of knockout/knockin or transgenic animals. However, the generation of these animals is expensive and time consuming. For SC-specific gene manipulation, crossing floxed strains with Cre mice or other conditional gene expression methods are necessary. This again is laborious and time intensive. In recent years, a cutting-edge genetic technology, the CRISPR-Cas9 system, has made the generation of genetically modified mice much quicker (about 4 weeks)2,3, but this method is hindered by target sequence limitations, and suffers from off-target effects. As an alternative method, viral vector-mediated gene transfer is a faster and easier method of achieving gene transfer into SCs in vivo4-6. Indeed, the generation of viral vectors is less expensive, and takes a shorter time (within a few weeks), and gene manipulation of SCs can be achieved by simply injecting engineered viral vectors, such as adenoviral vectors, adeno-associated viral (AAV) vectors, and lentiviral vectors, into the sciatic nerve. Because these viral vectors have different characteristics, users have to choose the one best suited for their purpose. Adenoviral vectors infect axons and SCs in both young and mature sciatic nerves. In particular, adenoviral vectors have higher selectively for non-myelinating SCs than myelinating SCs. Adenoviruses can cause immune responses, and accordingly, immunodeficient strains should be used5. AAV vectors are currently the most widely used viral vectors, and allow in vivo gene transfer with lower toxicity7. AAV can transduce both axons and SCs by direct injection into the nerve fibers8,9. However, AAV-mediated protein expression usually requires 3 weeks or longer to reach maximum levels7,9. Therefore, it is difficult to analyze myelination, which actively progresses during the two week postnatal period. Lentiviral vectors have higher selectively for myelinating SCs than non-myelinating SCs, and do not have toxic effects on sciatic nerves. However, lentiviral vectors do not infect SCs in more mature nerves5, and therefore are unsuitable for analyzing events such as the demyelination process. Electroporation is another faster and easier approach to achieve in vivo gene transfer. It has been reported that in vivo transfection of SCs can be achieved when electroporation is applied to transected rat sciatic nerves10. However, because this method requires nerve transection for gene delivery, the application is limited to the analysis of the damaged nerves. Here, we describe an alternative method that allows the delivery of transgenes into myelinating SCs in intact rat sciatic nerves using electroporation11. This method requires plasmid construction, which can usually be completed within a week. Then, by simply delivering electric pulses to the site on the sciatic nerve where the plasmid DNA was injected, highly selective transfection of myelinating SCs can be achieved in neonatal as well as in more mature animals. By electroporating multiple plasmids, simultaneous expression of a variety of genes can be easily achieved. The ability to simultaneous express multiple molecules, such as signaling proteins, short-hairpin RNAs (shRNAs) and functional probes, is crucial for investigating complex processes such as myelination and demyelination. The novel in vivo electroporation method described in this paper will be a powerful tool, allowing researchers to analyze the function of a multitude of molecules and their interactions in myelinating SCs. The use of rats for research was in accordance with guidelines established by the Animal Welfare Committee of The University of Tokyo. Generate DNA plasmids for in vivo electroporation by subcloning the cDNA or shRNA sequence into an expression plasmid for mammalian cells12. Use a cytomegalovirus immediate early enhancer and chicken β-actin promoter fusion (CAG) promoter-driven plasmid13 because it allows strong and stable expression. For expression of shRNAs under the control of a CAG promoter, use a mir30-based shRNA cassette system for subcloning the shRNA14. Purify plasmid DNA with a maxi-prep kit according to manufacturer's instructions, and resuspend the DNA with HEPES-buffered saline (140 mM NaCl, 0.75 mM Na2HPO4, 25 mM HEPES; pH 7.40). Adjust the concentration of DNA to ≥4 µg/µl. Prepare the plasmid DNA solution to a concentration of 4 µg/µl, and add a minimal amount of fast green dye (final concentration of 0.01%) to label the injection site. When simultaneous electroporation of multiple plasmids is required, adjust the total concentration of the plasmid DNA solution to 4 µg/µl. Note: The optimal composition of plasmid DNAs should be determined according to the transfection efficiency of each plasmid. Autoclave surgical instruments and the 0.9% NaCl solution. Pull glass pipettes using a pipette puller. Cut the tip of the pipette to a diameter of 30-50 µm. Use the following parameters: Heat, 600; Velocity, 50; Time, 75. Note: An overview of this step is described in Figure 1. Although the procedure for rat pups are described here, the method is also applicable to more mature animals using the same procedure. Anesthetize the rat with isoflurane in the induction box until the animal becomes immobile by adjusting the oxygen flow to 0.4 L/min and the isoflurane concentration to 4% (vol/vol). Perform toe pinching to confirm proper anesthetization. Put the rat on the preheated warmer under a binocular microscope, and maintain anesthesia by continuously administering isoflurane through the face mask. Adjust the oxygen flow to 0.2 L/min and the isoflurane concentration to 2% (vol/vol). Use eye drops to prevent dryness of eyes if the eyes of the animal are open. Fix the legs with surgical tape. Clean the skin on the posterior thigh with povidone-iodine, and make an incision with a scalpel. Note: Shave surgical areas if the surgical areas are covered with hair. Expose the sciatic nerve by creating an opening between the quadriceps femoris muscle and biceps femoris muscle with sewing needles. Wet the nerve with 0.9% NaCl solution. Absorb excess water with lint-free paper. Insert the base of a glass micropipette onto flexible tubing, and fill the adequate amount of DNA solution (at least one microliter) into the micropipette by gently aspirating. Lift the exposed nerve by gently pulling the distal side of the nerve using a needle. Note: Do not apply tension to the nerve to minimize mechanical stress. Insert the glass micropipette into the distal site on the nerve, and inject the DNA solution by applying pressure (i.e. by blowing into the open end of the flexible tube). Inject DNA solution until the nerve appears green (1 µl maximum). Because frequent insertion of the micropipette can damage the nerve, do not insert the micropipette more than twice. Place a tweezer-type platinum electrode about 1-2 mm apart from the nerve. Fill the gap between the electrode and the nerve with 0.9% NaCl solution. Note: Do not hold the nerve with the electrode to avoid mechanical stress on the nerve. Apply electric pulses to the injection site using an electroporator with the electrode. After the first pulse set, invert the electrode and apply another pulse set. Use the following parameters: voltage, 50 V; pulse duration, 5 msec; pulse interval, 100 msec; pulse number, 4 times. Clean the electroporation site with 0.9% NaCl solution. Repeat steps 4.4-4.11 on the contralateral sciatic nerve. Close the incisions with cyanoacrylate glue. After drying the glue, clean the wound with povidone-iodine. Release the pup from the face mask. Warm the pup on a warmer at least for an hour in order to allow it to fully recover from anesthesia. Do not leave the pup unattended until it has regained sufficient consciousness. After recovery from anesthesia, return the pup to the mother rat. Do not return the pup until fully recovered. House the rat pups in the cage until conducting the experiments11 (see examples in Figure 3). Administer carprofen (5 mg/kg; i.p. ), a non-steroidal anti-inflammatory drug, or buprenorphine (0.1 mg/kg, s.c.), an opioid analgesic, if required. Note: If the rat pup does not grow well or inflammation is observed around the surgery site, exclude the animal from the experiments. An example of a sciatic nerve transfected with red fluorescent protein (RFP)-expressing plasmid is shown in Figure 2A. Cells showing bipolar morphology, a characteristic of SCs, were sparsely transfected with RFP. No RFP fluorescence was detected in axons. We usually find ~100 transfected SCs in every nerve. This transfection efficiency seems similar to the in vivo SC infection efficiency using lentiviral vectors4. Immunostaining experiments showed that most (~96%) RFP-positive cells at P7 co-labeled for S100, a SC marker (Figure 2B), and 91% of RFP-positive cells at P14 co-labeled for MBP, a myelinating SC marker (Figure 2C), suggesting that gene transfer by electroporation is highly selective for myelinating SCs. Introduction of multiple genes into SCs in vivo will be extremely useful for investigating the mechanisms of myelination/demyelination. A major advantage of the in vivo electroporation method described here is the capacity to transfer multiple genes with a simple procedure. Figure 2D shows a representative image of a sciatic nerve transfected with a mixture of GFP and RFP-expressing plasmids using in vivo electroporation. About 97% of SCs were GFP and RFP double positive, suggesting that highly efficient delivery of multiple genes can be achieved by simply electroporating mixtures of multiple plasmids. In rodents, myelination initiates around birth, dramatically increasing during the first two weeks postnatally, and then gradually diminishes. Thus, by genetically manipulating SCs during these developmental time windows, the mechanisms underlying these different stages of myelination can be clarified. Lentiviral vectors are a good tool for analyzing myelination, particularly as they have minimal toxicity, but lentiviruses only infect neonatal sciatic nerves5,6. In comparison, electroporation-mediated gene transfer works well when transfection is conducted on P3 (Figure 2E, top) or on P14 (Figure 2E, bottom). The applications of the novel in vivo electroporation method are described here. Figure 3A shows light microscopic images of GFP-expressing myelinating SCs at various developmental stages (P7, P14, P21 and P31). By light microscopic analysis, changes in morphological parameters, such as length and diameter, can be assessed. Note that these parameters have similar values compared to intact rat peripheral nerves15,16, suggesting that the electroporated nerves develop without significant damaging effects. Figure 3B shows an electron microscopic image of LacZ-expressing myelinating SCs. In this case, LacZ was used as an expression marker. β-galactosidase staining using bluo-gal, an ethanol-insoluble substrate, enables the analysis of myelin structure of transfected SCs by electron microscopy11,17. In these experiments, the role of signaling molecules can be examined by silencing or augmenting their expression, thereby allowing the analysis of loss-of-function or gain-of-function effects. In addition to the analysis of fixed tissue, in vivo electroporation-mediated gene transfer can be also applied to live imaging experiments. 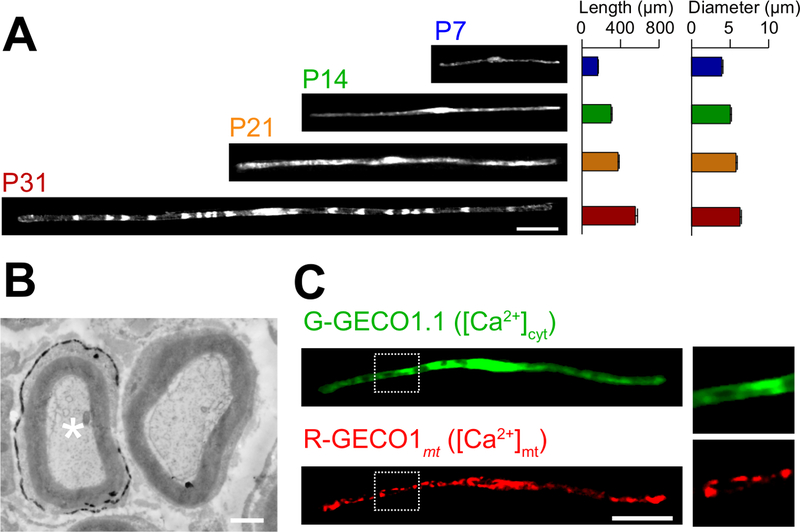 For example, Figure 3C shows a myelinating SC co-expressing G-GECO1.118, a green fluorescent cytosolic Ca2+ indicator, and R-GECO1mt19, a red fluorescent mitochondrial Ca2+ indicator. By expressing these indicators, we identified a signaling pathway that controls cytosolic and mitochondrial Ca2+ concentrations in myelinating SCs. Thus, the present method can be used to study a variety of signaling mechanisms, particularly when genetically-encoded fluorescent probes are available to detect the signals of interest. Figure 1: Schematic of the in vivo Electroporation Method. First, the sciatic nerve of the anesthetized rat is exposed. Second, plasmid DNA is injected into the sciatic nerve. Third, electric pulses are delivered to the injection site through the forceps-shaped electrode. Finally, the wound is closed with glue. This procedure can be repeated on the contralateral nerve. Please click here to view a larger version of this figure. Figure 2: Representative Results on Transfected Sciatic Nerves. (A) A representative image of a transfected sciatic nerve. The nerve was transfected with RFP-expressing plasmid at P3, and fixed at P7. (B) A representative image of a RFP-transfected cell at P7 showing colocalization with S100, a SC marker. (C) A representative image of a RFP-transfected sciatic nerve at P14 showing colocalization with MBP, a myelinating SC marker. (D) A representative image of a sciatic nerve cotransfected with GFP and RFP-expressing plasmids. Transfected SCs simultaneously expressed GFP and RFP. (E) An image of myelinating SCs at P31 transfected at P3, when myelination begins (top), and an image of myelinating SCs at P31 transfected at P14, when most large axons become myelinated (bottom), suggesting that transfection of myelinating SCs can be achieved not only in neonatal nerves, but also in more mature nerves. Scale bars = 200 µm (A); 50 µm (B-E). This figure was modified from our previous publication11. Please click here to view a larger version of this figure. Figure 3: Application of in vivo Electroporation. (A) A light microscopic analysis of the development of myelinating SCs. Sciatic nerves were electroporated with GFP-expressing plasmid at P3, and were fixed at various developmental stages (P7, P14, P21 and P31). Representative images of GFP-positive SCs are shown on the left. The average length and diameter are summarized as mean ± SEM (n = 30 - 47 from 3 nerves) on the right. The length and diameter of myelinating SCs increases as development proceeds. (B) An electron microscopic image of a sciatic nerve transfected with a plasmid encoding LacZ. A transfected SC (white asterisk, left) was finely labeled with precipitates of the β-galactosidase reaction product. (C) An image of a SC cotransfected with G-GECO1.1, a green fluorescent cytosolic Ca2+ indicator, and R-GECO1mt, a red fluorescent mitochondrial Ca2+ indicator. The regions within the white dotted rectangles are shown enlarged in the panels on the right. Scale bars = 50 µm (A and C); 1 µm (B). This figure was modified from our previous publication11. Please click here to view a larger version of this figure. In this paper, we describe a simple and efficient method that allows in vivo gene transfer to myelinating SCs in the rat sciatic nerve using electroporation. This method allows highly selective gene expression in myelinating SCs by simply applying electric pulses to the plasmid DNA-injected sciatic nerve. Because the molecular mechanisms of myelination and demyelination in the peripheral nervous system remain unclear, the present in vivo electroporation method will be a powerful tool to clarify the roles of multiple genes of interest in living animals. A critical requirement of this method is to keep damage to the nerve during surgery to a minimal level. Should surgical damage cause excessive inflammation, the sciatic nerve may degenerate. To avoid this, one must conduct surgery with extreme care, so as to not damage the blood vessels around the nerve. Mechanical stress to the nerve during the surgery can also be a cause of nerve damage. To minimize mechanical stress, lifting the exposed nerve should be done as gently as possible, and the tweezer-type electrode should be placed close to the nerve without contact. Furthermore, electrical pulses that are too strong can cause undesirable large leg movement, which leads to mechanical stress, or can burn the nerve. If significant damages are observed in the nerves, we recommend reducing the electrical pulse intensities or placing the electrode further away from the nerve. In our present protocol, CAG promoter-driven plasmids were used as expression vectors. CAG promoter-driven plasmids allow high levels of gene expression in myelinating SCs in vivo. We also have tried a CMV promoter, another widely used universal promoter for mammalian gene expression, but expression of the gene product was very weak. This is consistent with previous results, in which electroporation-mediated transfection was conducted in the embryonic brain20. Therefore, we recommend using CAG promoter-driven plasmids for the in vivo electroporation method. Because axonal signaling is a key factor in myelination/demyelination21, gene modification in neurons is also important. However, delivery of transgenes using our in vivo electroporation method is limited to SCs. It has been reported that gene delivery into sciatic nerve axons can be achieved when in vivo electroporation is applied to dorsal root ganglion (DRG) neurons in adult rats22. This suggests that delivery of plasmid DNA to the cell body is likely to be critical for in vivo transfection of peripheral axons. Thus, to examine the involvement of axonal molecules in myelination/demyelination, researchers should use neuron-specific genetic methods such as genetically modified animals, neuron-specific viral vectors, or in vivo electroporation to DRG neurons. Compared with current methods, such as the generation of genetically modified animal lines23 and delivery of transgenes by viral vectors4-6, gene modification of SCs by in vivo electroporation is simpler. This method only requires several days for plasmid DNA construction and one day for electroporation surgery. Plasmid DNA construction does not require a biohazard room that is usually essential for viral vector handling. In addition, one of the advantages of the electroporation method is the capacity for simultaneous expression of multiple gene products using a simple protocol. Our novel technique will be useful for analyzing the interaction of a variety of signaling molecules involved in myelination and demyelination. In particular, by permitting the cotransfection of a number of different intracellular fluorescent probes, our method should be a powerful tool for investigating intracellular signaling dynamics in SCs using live imaging experiments. This work was supported by grants from the Ministry of Education, Culture, Sports, Science and Technology to M.I. (21229004 and 25221304). Nave, K. A., Werner, H. B. Myelination of the nervous system: mechanisms and functions. Annu Rev Cell Dev Biol. 30, 503-533 (2014). Yang, H., Wang, H., Jaenisch, R. Generating genetically modified mice using CRISPR/Cas-mediated genome engineering. Nat Protoc. 9, 1956-1968 (2014). Cotter, L., et al. 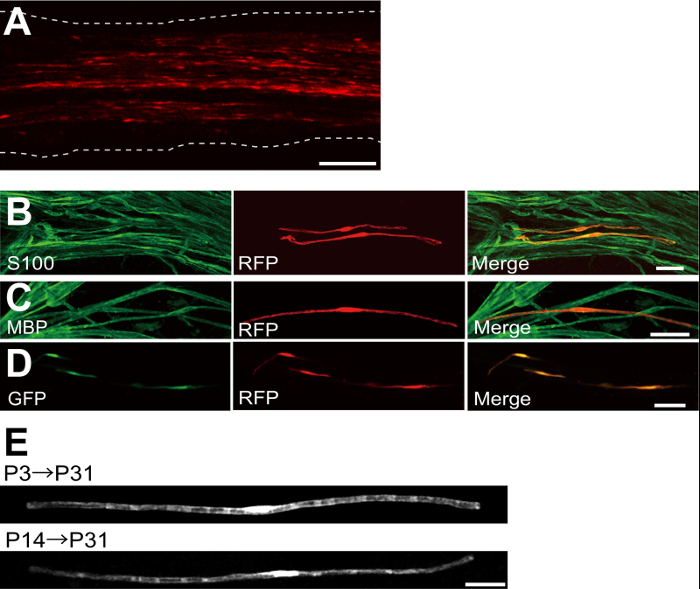 Dlg1-PTEN interaction regulates myelin thickness to prevent damaging peripheral nerve overmyelination. Science. 328, 1415-1418 (2010). Gonzalez, S., Fernando, R. N., Perrin-Tricaud, C., Tricaud, N. In vivo introduction of transgenes into mouse sciatic nerve cells in situ using viral vectors. Nat Protoc. 9, 1160-1169 (2014). Ozcelik, M., et al. Pals1 is a major regulator of the epithelial-like polarization and the extension of the myelin sheath in peripheral nerves. J Neurosci. 30, 4120-4131 (2010). Daya, S., Berns, K. I. Gene therapy using adeno-associated virus vectors. Clin Microbiol Rev. 21, 583-593 (2008). Glatzel, M., et al. Adenoviral and adeno-associated viral transfer of genes to the peripheral nervous system. Proc Natl Acad Sci U S A. 97, 442-447 (2000). Homs, J., et al. Schwann cell targeting via intrasciatic injection of AAV8 as gene therapy strategy for peripheral nerve regeneration. Gene Ther. 18, 622-630 (2011). Aspalter, M., et al. Modification of Schwann cell gene expression by electroporation in vivo. J Neurosci Methods. 176, 96-103 (2009). Ino, D., et al. Neuronal Regulation of Schwann Cell Mitochondrial Ca(2+) Signaling during Myelination. Cell Rep. 12, 1951-1959 (2015). Struhl, K. Chapter 3; Subcloning of DNA fragments. Curr Protoc Mol Biol. Unit3 16 (2001). Niwa, H., Yamamura, K., Miyazaki, J. Efficient selection for high-expression transfectants with a novel eukaryotic vector. Gene. 108, 193-199 (1991). Chang, K., Elledge, S. J., Hannon, G. J. Lessons from Nature: microRNA-based shRNA libraries. Nat Methods. 3, 707-714 (2006). Schlaepfer, W. W., Myers, F. K. Relationship of myelin internode elongation and growth in the rat sural nerve. J Comp Neurol. 147, 255-266 (1973). Webster, H. D. The geometry of peripheral myelin sheaths during their formation and growth in rat sciatic nerves. J Cell Biol. 48, 348-367 (1971). Weis, J., Fine, S. M., David, C., Savarirayan, S., Sanes, J. R. Integration site-dependent expression of a transgene reveals specialized features of cells associated with neuromuscular junctions. J Cell Biol. 113, 1385-1397 (1991). Zhao, Y., et al. An expanded palette of genetically encoded Ca(2)(+) indicators. Science. 333, (2), 1888-1891 (2011). Suzuki, J., et al. Imaging intraorganellar Ca2+ at subcellular resolution using CEPIA. Nat Commun. 5, 4153 (2014). Tabata, H., Nakajima, K. Labeling embryonic mouse central nervous system cells by in utero electroporation. Dev Growth Differ. 50, 507-511 (2008). Taveggia, C., Feltri, M. L., Wrabetz, L. Signals to promote myelin formation and repair. Nat Rev Neurol. 6, 276-287 (2010). Saijilafu,, Hur, E. M., Zhou, F. Q. Genetic dissection of axon regeneration via in vivo electroporation of adult mouse sensory neurons. Nat Commun. 2, 543 (2011). Tanaka, Y., Hirokawa, N. Mouse models of Charcot-Marie-Tooth disease. Trends Genet. 18, S39-S44 (2002). Thanks you for publishing this method. I am very concerned with the possible damage done from the method on the nerve. Stretching the nerve, shown in the video, is clinically known to be highly damaging to nerves. Have you performed any studies to determine if there is damage done to the nerve because of the method? This would involve electron microscopy, and perhaps also ATF3 in the DRG. Unless such studies have been performed, and shown not to affect the nerve in terms of axonotmesis, this is also seems to be a model of neuropathy. Thank you for your comment. As you indicated, too strong mechanical stress can cause severe damage to the sciatic nerves. To avoid the damaging effects by mechanical stress, we lift the exposed nerve using a needle as gentle as possible. When the surgery is successfully conducted, the nerves normally develop and no apparent damages are observed in electron-microscopic and optical-microscopic analyses. We described the tips to avoid the significant damages during surgery in Discussion. Please refer to them.